In a valley like this one, Galetzka must mount the GPS station to the most sessile object he can find, like a large rock. If he places it in soil or sediment, it will move in any disturbance, like a landslide. 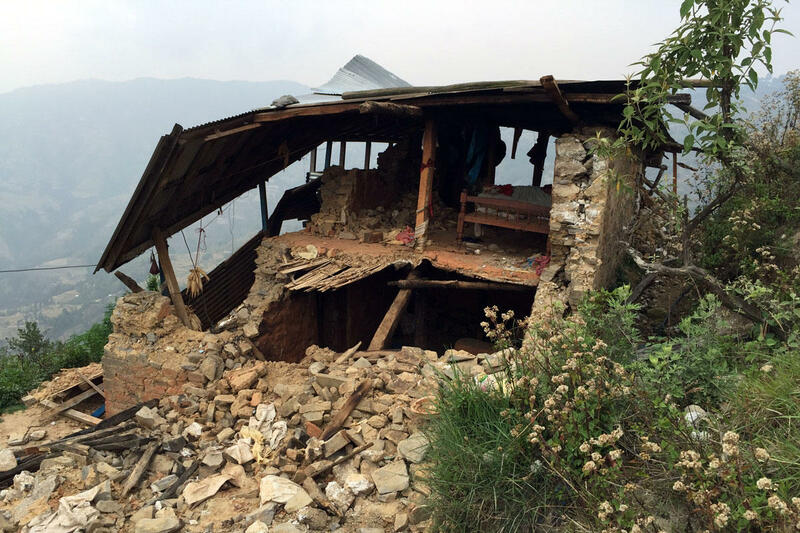 An earthquake damaged home in Nepal. When a magnitude 7.8 earthquake hit Nepal in spring 2015, John Galetzka hopped on a plane to Kathmandu. 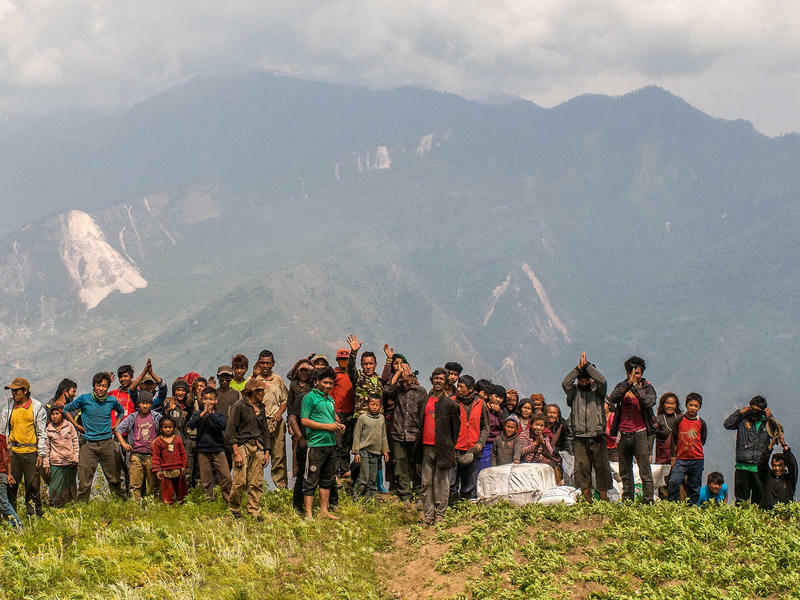 "I arrived four days after the April 25th earthquake," he says. In the first weeks he was there, he would hear aftershocks throughout the night. 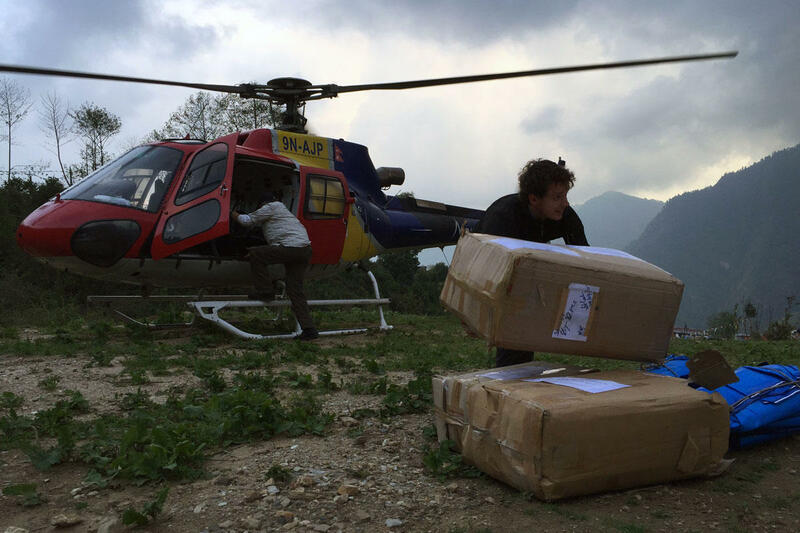 Galetzka spent about two months after the quake collecting data from GPS stations around Nepal as part of his job. He works at UNAVCO, a geoscience nonprofit in Boulder. By watching watching the subtle -- and sometimes sudden -- land movements, he hoped to find out more about predicting earthquakes in the future. Galetzka's GPS stations use distant objects in space to measure the minuscule motion of the Earth's tectonic plates -- the massive segments of the crust that hold up continents and oceans. Versus your everyday GPS, like in your car or phone, which are accurate to a range of 10 feet, Galetzka's are "accurate down to the millimeter," he says. There are 28 stations in Nepal, and every 15 seconds, each one records its location. 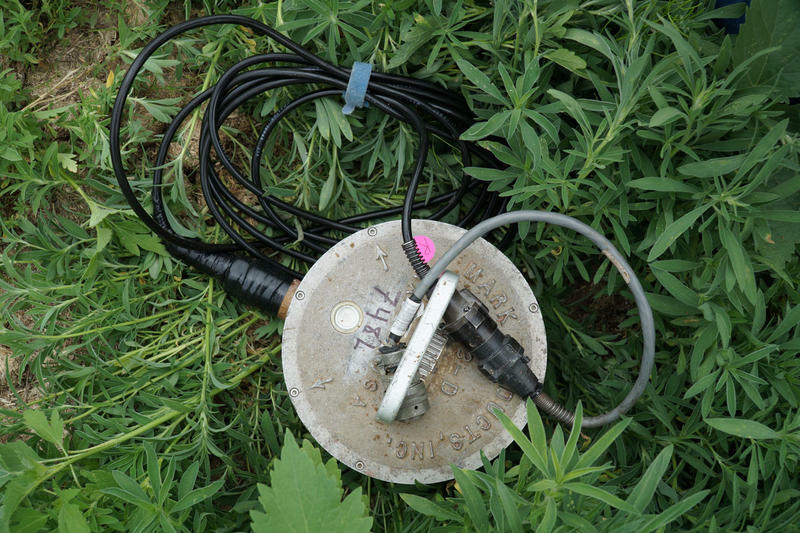 In turn, the data is used to map the location of the ground and track its movements. If all are functioning properly, 28 daily updates come back to Galetzka in the U.S. over a cellular data connection. The problem though was that they weren't, Galetzka had only been hearing from nine of his stations. Making his way around the country with his colleague Mike Fend, he found that many of the stations were still recording data. They just weren't reporting it back. Better yet, there was a much higher frequency setting on the stations that he hadn't been collecting from because it was too expensive to send that much data. As he visited each GPS, he could retrieve the files himself -- including 15 measurements every second from when the earthquake occurred. Using equipment and helicopter transport donated by GPS Company Trimble, Galetzka was able to get around the devastated country and visit data sites in minutes, rather than hours or days by jeep or foot. "We would bring relief supplies as well," says Galetzka. "We would go fully loaded with blankets, tarps, rice. We never went empty-handed to these places." Every time Galetzka and Fend made a trip to a village, they brought supplies to share. 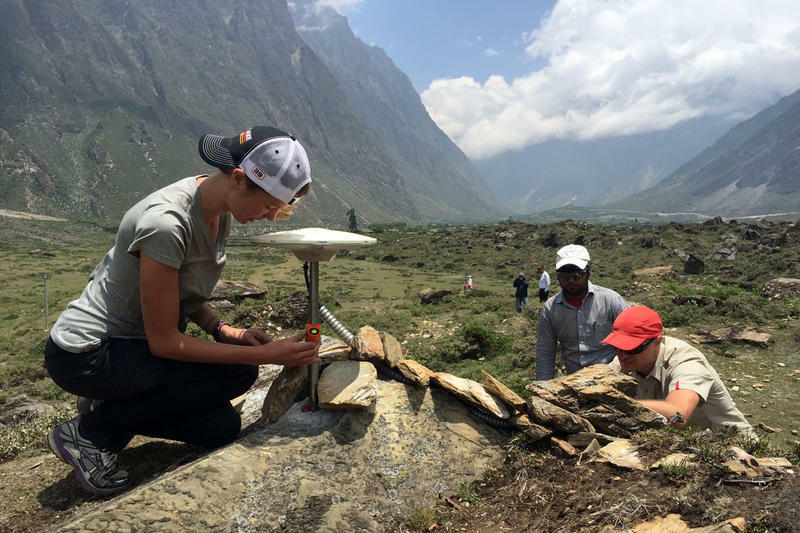 The data he retrieved from Nepal shows how the land around the fault line moves. What's surprising is how the land doesn't move evenly. The results were published in the journal Science. "There were parts that moved only 50 centimeters and there were parts that moved more than 4 meters," says Diego Melgar, a postdoctoral student at UC Berkeley who studies earthquakes, and co-authored the paper. 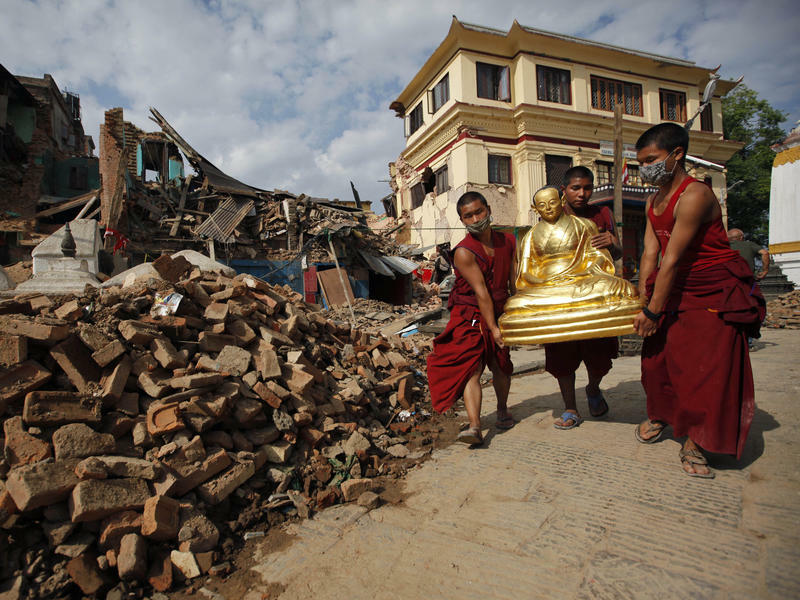 "The parts that moved most were right beneath Kathmandu." The earthquake's speed also slowed down before it reached the city. When the fault first ruptured, the two halves slipped at 3 kilometers per second, a normal speed for an earthquake. By the time it reached Kathmandu, the movement was only about 3 feet every five seconds. 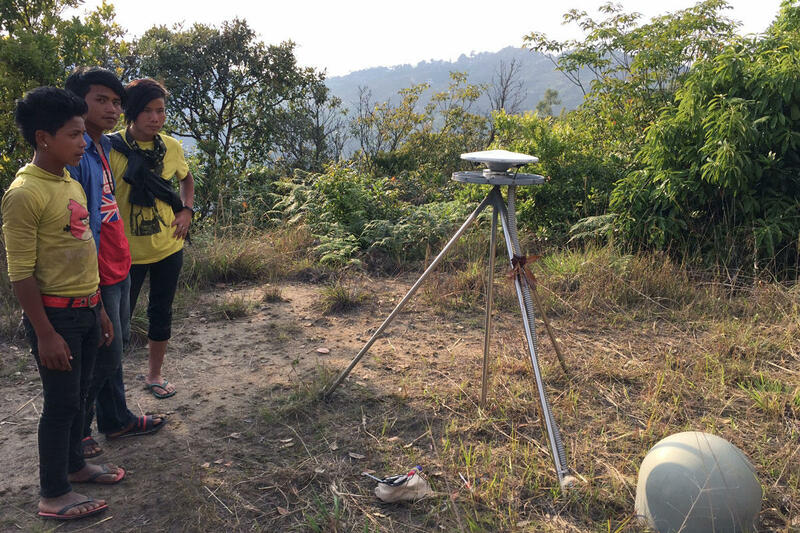 Residents of a village in Nepal survey a GPS station after the 2015 spring earthquake. 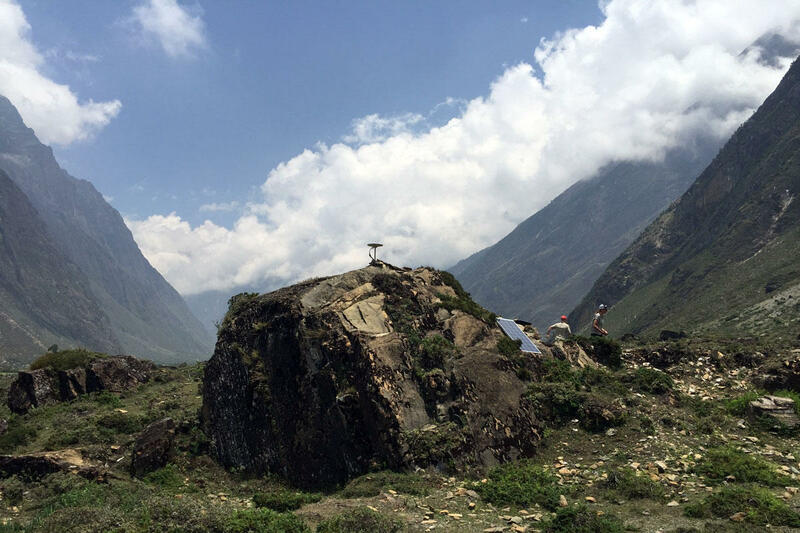 The station measures the motion of the tectonics plates underneath Nepal. "It's not very fast. It's a gentle motion," says Melgar. Knowing where and how the land moved during this earthquake helps researchers estimate the strain on the fault line. For example, the land along the fault farther west of Kathmandu hasn't been moving as much, and Galetzka estimates there's a lot of strain on the fault line in that region. Eventually that strain will force the two plates past each other. When that happens Galetzka predicts a serious earthquake. Yet, he can't say when. That's the problem with earthquake prediction: you can't tell when it will happen, you just have a sense of where and how bad. For now, he has to convince locals to invest in stronger infrastructure and think through emergency plans. People have to pass that knowledge down, since the next big earthquake might not happen for decades or even centuries. "We know it's going to be an earthquake," says Galetzka. "We can't say when it's going to happen, but it will happen." In May of 2014 there was an earthquake in Greeley. This rarely happens, and scientists quickly started monitoring the area. A few quakes later, regulators ended up shutting down a wastewater injection well that took water from nearby drilling operations. Human-caused earthquakes are not new, but they've become more common, as oil and gas production has ramped up across the U.S., bringing wastewater disposal wells along with it. While most disposal wells don't cause earthquakes, the lubrication they cause can lead to tremors in unexpected places – like the one in Greeley. A new publication [.pdf] and map produced by the U.S. Geological Survey shows just where that increase in activity is. Swayambhunath — also known as the Monkey Temple, for its holy, furry dwellers that swing from the rosewood trees — is one of the oldest and most sacred Buddhist sites in Nepal's Kathmandu Valley, an important pilgrimage destination for Hindus as well as Buddhists. It was also one of the worst damaged by last month's earthquake. What kind of man or woman risks their lives for strangers? Eric Seaman of Murrieta, Calif., was 30. He had two children, and was a U.S. Marine sergeant. His wife, Samantha Seaman, told CNN, "Last week I got an email telling me that he felt purpose and that he delivered 10,000 pounds of rice ... and I know that right before he passed away, I know that he helped somebody." Sara Medina was 23. She enlisted in the Marines just out of high school in Aurora, Illinois, and served in South Korea, South America and Okinawa.